Gamers have a tendency to be immature. I don’t know why it’s so often the case, but the gaming community tends to be a wee bit more toxic than most. Sure, there are plenty of mature, reasonable individuals in the gaming community, but it’s also littered with people who seem to get offended by the idea that someone owns a console they don’t have (with their reasons for not having it largely being because it isn’t made by the the brand they’re loyal to). And such toxicity is often at its most prominent when it comes to Nintendo’s detractors. Now, don’t get me wrong, this same toxicity can often be found from within Nintendo’s fanbase as well – I seem to recall many Nintendo fans crying foul when Super Mario Galaxy overtook Ocarina of Time’s place as the best reviewed game on GameRankings (because how dare something newer be good? ), and many of them seem to get bent out of shape whenever a Zelda game scores anything less than a 10 from critics – but it really seems like Nintendo, more than any other publisher/developer, is in a “damned if they do, damned if they don’t” situation when it comes to the gaming community. Alright, I understand that Nintendo has had their hat in the ring longer than Sony or Microsoft, and they have the longest-standing franchises in the business, so if any party in this equation is going to get unfair flak in these categories, Nintendo has the biggest bullseye on their head for these trolls. But just because something is older doesn’t mean that it’s supporters are just blinded by their nostalgia. 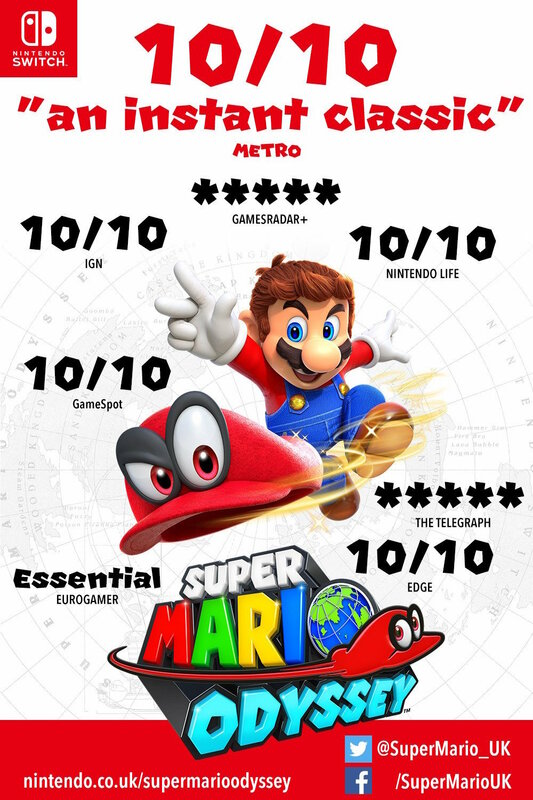 Super Mario Odyssey, Nintendo’s newest major release, has achieved universal critical acclaim (it has currently displaced Galaxy as the best reviewed game on GameRankings as of this writing) which, naturally, has brought the usual trolls out of the woodworks. It’s almost humorous, really, how quickly these people resort to the same old song and dance. “Reviewers are all just biased for Mario,” and things of that nature will be uttered a lot. Because obviously every last critic who praises a Mario game is clearly just biased. Seriously, this is conspiracy theory levels of nonsense. Did it ever dawn on these people that maybe, just maybe, Mario games tend to be really good, and people tend to really like them? Of course such a thought never would dawn on them, considering they’re so quick to assume that every last video game critic is under some kind of spell of bias. And these are the same people who, whenever a Nintendo game gets a less-than ideal review, will hail such instances as “honest” reviews, again implying that any praise a Nintendo title gets isn’t honest, and is instead just some meaningless gushing that exists purely out of a blind brand loyalty (which is, ironically, the thing that’s likely fueling their assumptions against critics in the first place). Assassins Creed Origins and Wolfenstein 2: The New Colossus were released the same day as Odyssey, and received great reviews of their own, many of which were by the same people who reviewed Odyssey. But apparently the concept of all these games being good is just too much for some people to process, and because one of those games happens to be part of a Nintendo franchise, it’s singled out as being part of some kind of game critic conspiracy. By this point, it’s pretty much become a bad joke, really. A Nintendo game gets rave reviews, and it’s all just little more than “Mario bias” and “nostalgia.” I think it’s safe to say that most people who make such claims have never actually owned a Nintendo console, just as the Nintendo fans who dismiss Sony and Microsoft have probably never owned one of those consoles at any point. Of course, not everyone can have every video game platform, and maybe some people just prefer to follow a particular brand, and that’s all cool and fine. But why do gamers have this weird tendency to take offense at the idea that other people like other things? Does a Mario game getting good reviews somehow take away from the games they like? Seriously, what’s the deal there? Again, Nintendo is far from the only victim of this epidemic, but it does seem to be the most prominent one. What, are all Nintendo game supposed to get bad reviews or something? I mean, geez, it’s not like every Nintendo game gets Odyssey’s reviews. Nintendo makes good games, and they make some bad games, and the critics respond accordingly. There’s no “bias” or “nostalgia blindness” about it. But I’ve liked Nintendo games in the past. So I guess I’m just a fanboy. If anything, I tend to find the overwhelmingly positive reviews of Nintendo games to be the least biased because at least with them, I know they achieved those accolades purely through the gameplay and not trying to be cool or super-artsy (how Polygon gave Gone Home a 10 and Fire Emblem: Awakening an 8.5, I’ll never know). That said, not every game Nintendo has made is perfect and I am more than willing to call out their misplays (i.e. Metroid: Other M and Yoshi’s Story). The worst part is when these cynical pseudointelectuals justify their absurd degree of scrutiny by saying stuff like “they have to balance stuff” or “get people off the hype train” by doing what? Submitting to an opossite direction but equal degree of mob mentality? You’re doing exactly the same as you condemn except much worse because it’s only done for the sake of spoiling people of their fun while seeking to elevate yourself intellectually. Just pathetic. I shared your article on my Disqus gaming news page, Video Game Facts! Check us out sometime when you can. Awesome! Feel free to share any of my writings if you think they’re good enough. I’ll be sure to check your site out.